I think I have about 10 water bottles chilling in my fridge right now. More water bottles than beer…lol. Great post! 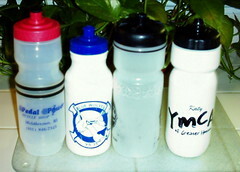 I think a water bottle would be a good as a race day souvenir (instead of the typical race day t-shirt, which we already have 50 of them sitting in our closets) :) I’m glad your training is going well.